Given the murderous nature of American cops her fear was more than rational. 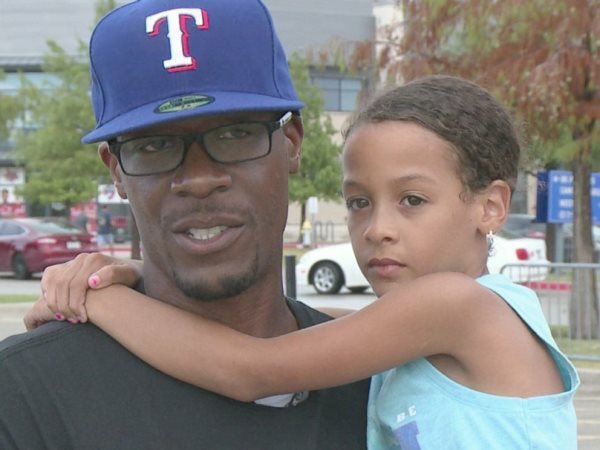 AFRICANGLOBE – Earlier this month, Michael Harris was targeted for revenue collection during a traffic stop by Frisco Police Officer Michael Collins. During the traffic stop, Harris’ 7-year-old daughter woke up from a nap and lost it when she saw the officer. Why? Because cops kill innocent people. While Collins was conducting the stop, Harris informed him that he was a concealed carry license holder. “I asked if he wanted to take it but he told me that wasn’t necessary,” Harris told WFAA in an interview. Philando Castile wasn’t so lucky during his traffic stop. When the innocent Castile informed officer Jeronimo Yanez that he was a lawful concealed carry license holder — he was murdered. Luckily for Harris, officer Collins wasn’t so trigger happy. Harris, who is also a Black man, is a truck driver and father of two whose life could have ended that day had a different officer pulled him over. When Harris’ daughter woke up to see her daddy interacting with a police officer, she started crying, rightfully fearful the officer would hurt her dad. “She’s seen a lot of stories on the news and one time she asked me why Black people and white people are killing each other, I didn’t know what to say,” Harris said. During the stop, however, things took a different turn. “I don’t want her to feel that way about police,” Harris said. The officer and Harris then proceeded to calm the girl down. Collins gave 7-year-old Mikylie an inside tour of his police cruiser and her fears subsided. “It meant a lot to see him take the time,” Harris said. In spite of the officer still writing Harris a ticket, the father of two took to Facebook to promote this unique situation showing a Black man and police officers getting along. “I don’t post on Facebook very much but I thought this was a good story for people to know,” Harris said. While this story of unity is certainly heartening, it doesn’t change the reality of the situation. Harris was a victim of the state’s revenue collection system and his daughter had every reason in the world to be fearful. While we certainly applaud the officer for not escalating the situation after finding out Harris had a weapon, and for comforting his daughter, the fact remains that other officers do not act in the same manner. Harris’ police stop was a crap shoot. Philando Castile had been stopped a whopping 52 times before he was murdered. All of these ‘offenses’ were non-criminal, had no victim, and were used to extract thousands from this poor man. According to the report, Castile was assessed at least $6,588 in fines and fees, although more than half of the total 86 violations were dismissed, court records show. Castile, and so many others like him, are ticking time bombs waiting for the wrong officer to pull them over. Until police curtail their practice of preying on Black people for revenue generation, all the kind-hearted gestures of calming children afraid of cops — are done in vain. And, the ticket that Harris still received proves it.